The Neo Trail off road outsole is designed with multidirectional lugs that maximize grip, a puncture-resistant layer that maximizes protection while being ultra-thin to maximize proprioception. This triple threat outsole combined with a water-resistant upper make this shoe perfect for every outdoor adventure. The zigzag, lace-lock structure is not only fashionable, but is designed to keep your foot secure, while the anatomic toe box and zero-drop profile allow your toes to splay and the foot to flex. Look great and move naturally as you tackle your greatest challenge with confidence. Upper - Hydrophobic Mesh: Non-toxic, breathable, lightweight, water-resistant thin mesh. 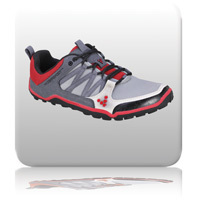 Lacing - Lock-Lacing System: Zigzag webbing eyelets make sure the foot is secure in the shoe. Collar/Panel & Lining - Dri-lex Lining with Thick Mesh Collar: Lightweight, performance lining for moisture wicking and superior comfort and thick mesh collar. Insock - Removable: 3mm Pressed EVA Insole for additional thermal protection when necessary. Sole Construction - Off Road: Rubber outsole specifically designed for off road surfaces with directional lugs to maximize surface contact for superior barefoot traction. Outsole Thickness - 2.5mm with 4.5mm lugs: Offering maximum proprioception with protection and ultimate grip. Toe Guard - Eco PU Toe Guard: Perforated Eco PU with abrasion resistant rubber protects the foot.